(Lancaster, Pa., June 23, 2016) - Imagine a sunny summer morning on one of the many farms that comprise Lancaster County. Picture a rising sun glistening behind the bright red barn. That is the concept behind the 2016 Atlantic League All-Star jerseys, unveiled today by the Lancaster Barnstormers and Atlantic League (ALPB) officials. The design is in accordance with the incorporation of Lancaster County agriculture as the theme of the All-Star event. The home Freedom Division squad will wear red, the primary color of the host Lancaster Barnstormers since the club’s inception in 2005. For the visiting Liberty Division squad, the jerseys will be a bright, sunny yellow, in line with that Lancaster County clear morning. On both sets of jersey, a Lancaster County “farmscape” is imprinted on the back. This “farmscape” runs consistently with the logo for the 2016 ALPB All-Star Game as does the font for the numerals and the “Liberty” and “Freedom” lettering on the two sets of uniform tops. 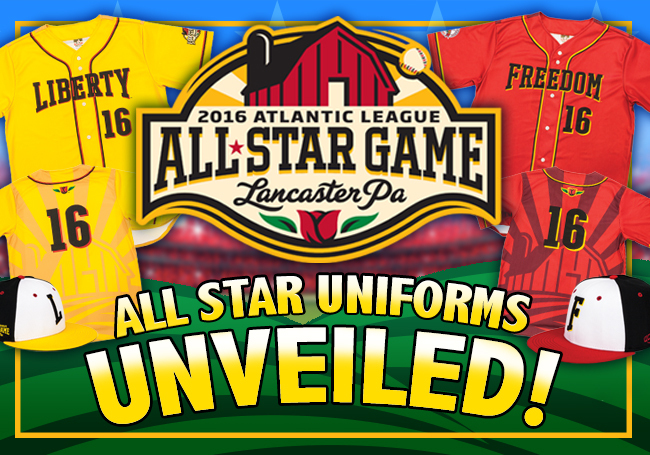 The 22 members of each All-Star Squad plus the respective coaching staffs will be dressed in these festive, one-time only jerseys, provided by TeamGear and manufactured by Alleson Athletic, the official uniform of the Atlantic League. Caps maintain the color scheme with red bills on the Freedom Division caps and buttons, while the Liberty Division will sport yellow bills and buttons on its caps. Both sets will contain the 2016 ALPB All-Star logo. Headwear for the 2016 ALPB All-Star Game is provided by OC Sports, the Atlantic League’s exclusive headwear partner. The Barnstormers partnered with Skye Design Studios (www.sdsbranding.com) to develop the 2016 Atlantic League All-Star Game logo and uniforms. SDS is a brand identity and design firm based in the greater New York City area with a satellite location in Winston-Salem, North Carolina. “The spirit of the All-Star Game is to celebrate and showcase the host area and the league. Lancaster itself is a vibrant region, so we wanted the look and feel of the All-Star Game to reflect those same qualities,” said Dillon.